Knee arthroscopy surgery is one of the most common and frequently performed orthopedic procedures today. According to the National Center for Health Statistics, more than 600,000 procedures are performed in the United States each year. Since this procedure was first performed decades ago, it has literally revolutionized the way injuries and conditions are treated. The procedure itself involves creating two to three small, ¼” stab wound incisions in the front of the knee called “portals”, through which a rigid fiber-optic lens is inserted into the knee joint through one of the portals. The lens is connected to a small video camera and the images are typically transferred onto a television monitor for easy viewing. The other portal slows for the introduction of a variety of equally small instruments designed to snip, grasp, cut and otherwise remove, tissue. Sterile fluid is introduced into the knee, under mild pressure, through one of the portals in order to inflate, or "distend" the joint. This allows for the safe introduction of the lens and hand tools so the smooth joint surfaces aren't accidentally scratched. In the vast majority of cases, most if not all the work can be accomplished through these portals. Knee arthroscopy surgery is utilized to treat a wide variety of knee conditions and injuries, such as a meniscus tears , ligament injuries such as an anterior cruciate ligament tear and shaving of arthritic surfaces. It is predominately an out-patient surgery and typically takes less than an hour. It is usually performed under an anesthetic, either spinal block or general anesthesia. 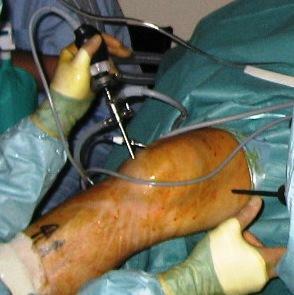 This surgical procedure can treat a torn knee cartilage mainly by using different types of snipping and cutting hand tools, combined with the use of a motorized rotary shaving system that can trim and re-shape that portion of the cartilage that is left behind after removing the torn portion. The photo above shows a meniscus that is torn, with a flap that has displaced out into the knee joint from its normal location, and can become a source for injury and damage to the joint cartilage, as well as block the knee from normal and full range of motion. If / when a knee becomes "locked" due to a cartilage tear similar to this one, surgery should be done sooner rather than later. In the early years, it was felt that if a portion of the cartilage was torn, the entire cartilage needed to be removed. That mindset has since changed substantially, in that the widely accepted practice now is, if possible, to remove only the affected part of the meniscus and re-shape the remaining meniscal tissue. 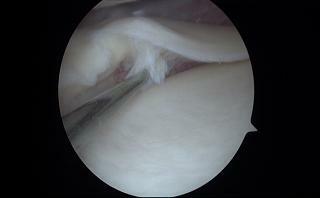 Occasionally the meniscus is too badly torn, or too degenerated, and is completely removed. Knee arthroscopy surgery can also treat osteoarthritis by utilizing various tips on the motorized shaving unit. It can remove rough jagged cartilage edges and debride the joint of loose bodies formed by cartilage flaking off the bone surface.